Termite swarm season typically starts in the spring for subterranean termites; however, not all termites within this species swarm at the same time. Termite swarm season for the dry wood termites and the damp wood termites typically occurs during the summer months. Weather conditions, the age, and the overall maturity of a colony will have a large impact on when swarming will occur. For example, there are termites that prefer moisture. If a good rain occurs, swarming may occur immediately thereafter. There are many colonies that will not start to swarm unless the colony is at least three years of age or older. For the purpose and intent of this guide, though, we will focus on the subterranean termite swarm season as these are the most common and problematic of all termite species. The subterranean termites are often seen swarming when the weather turns warm in the spring months. In most instances, the swarm does not occur until immediately after a strong rain event. When termite swarm season starts, it marks a period when a group of the insects are seeking to initiate their very own colony. In the case of subterranean termites, the insects that swarm are usually at least three years of age. It is at this time that nymphs are produced. These nymphs will turn into swarmers that have a set of wings. Once they become swarmers, they will leave the original colony by flying away. Immediately thereafter, the swarmers will pair themselves up with a mate. Once this has occurred, the pair will then initiate the search for a location to start their own colony. Once a location has been found, the wings will drop from the swarmers and they will then mate. The female that becomes part of the new colony during termite swarm season becomes the queen of that colony. She will then lay eggs. These eggs will hatch and the resulting termites will become the workers. A few of the hatchlings will also become soldiers. Their task is to defend the queen and the other termites that are part of the colony. Amazingly, a queen has the ability to lay well over a million eggs over the course of her lifetime. There are secondary females that reproduce within a colony; however, none of these take the place of the queen until the queen has died. 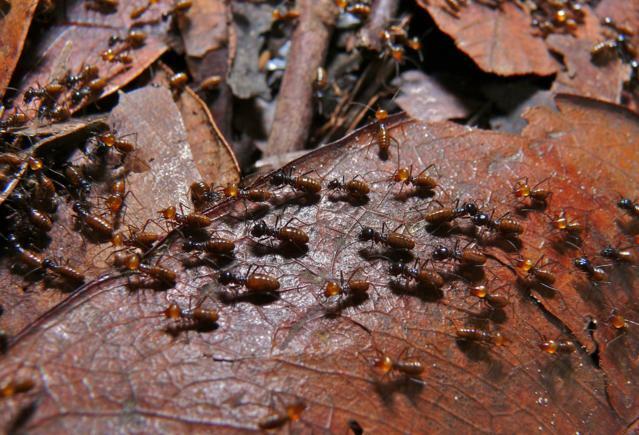 During termite swarm season, it is possible to confuse the insects with swarming ants; however, there are ways to properly distinguish one from the other. Termites have two pair of wings. Each pair is equal when it comes to length. The swarmer ant also has two pair of wings; however, one pair of the ant’s wings is smaller in length than the other pair. If there are unusual insects in your home during the warm months – especially after a strong rain – contact us! We can quickly identify the insect and eliminate the pests safely.